Suffolk towns and villages, including Sudbury, Lavenham, Long Melford, Clare, Cavendish and Bury St. Edmunds to suit your group. Collectively known as the Suffolk Wool Towns and Villages, a trip to this area combines beautiful countryside, and a chance to explore historic buildings. The villages are the result of the wealthy wool trade of the 14th and 15th century. 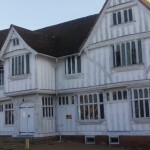 This tour is a chance to explore the beautiful villages with their Medieval houses, and glorious parish churches such as the cathedral like Holy Trinity Church in Long Melford. There are many tearooms and pubs for refreshments stops, and good opportunities for some retail therapy. There are a number of National trust properties in the area, Lavenham Guildhall, Melford Hall and Ickworth House, which can be included in the itinerary. All the tours can be tailored to meet the needs of your party. For more information please email us (essexdaysout@gmail.com) or use our contact form and I will get back to you.